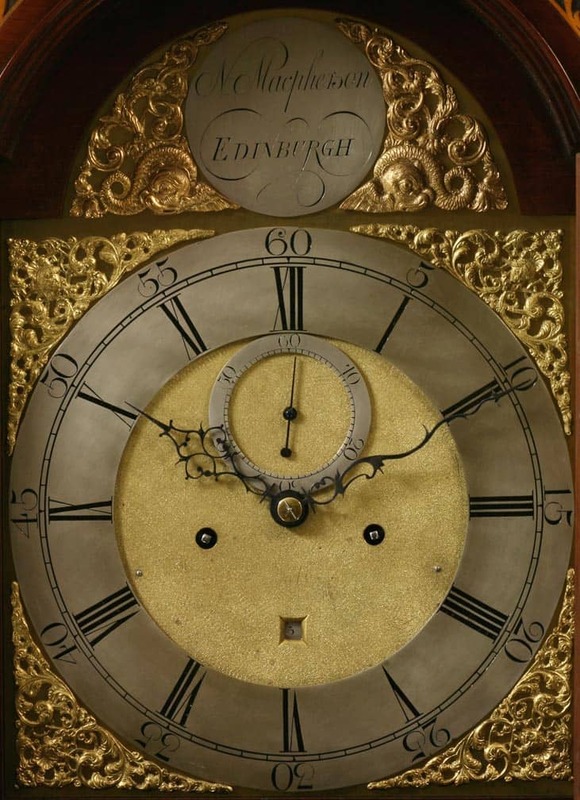 AN EIGHT DAY MAHOGANY BRASS DIALLED SCOTTISH LONGCASE CLOCK. CIRCA 1780. 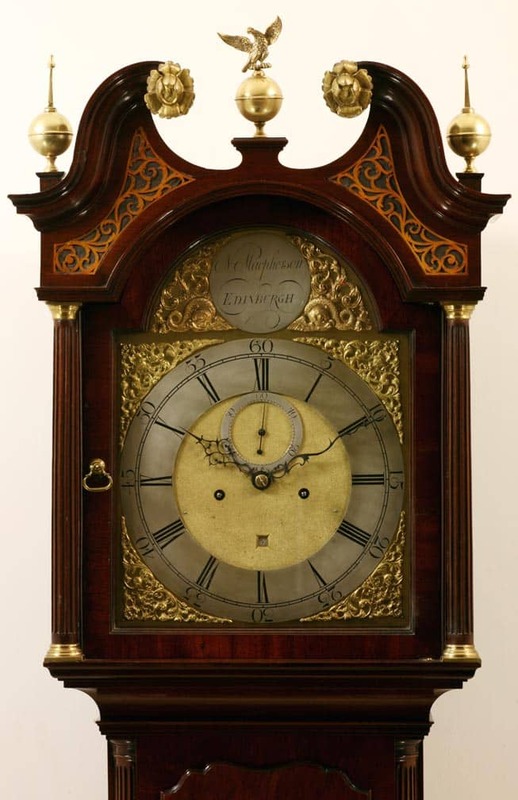 A well proportioned and attractive eight day Scottish longcase clock. The case with a swan necked pedimented top with strong mouldings to the swan neck has gilded carved wood rosettes to the end of each side of the swan neck and blind yew wood frets. 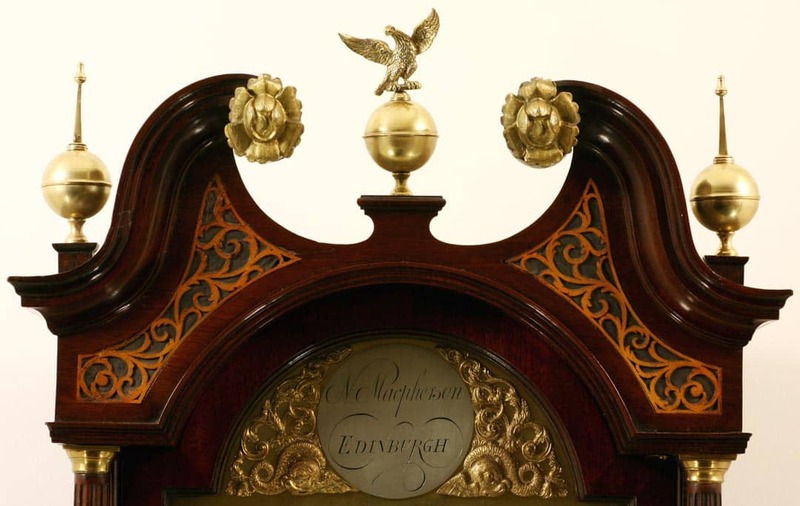 There is a ball and eagle finial in the middle and two ball and spire finials on either side. The hood columns at the front are brass mounted and the trunk of the clock has reeded canted corners with a full length opening door with shaped top. The clock has a plain plinth with a fretted out four footed plinth. The mahogany veneers throughout the clock are of fine quality. The brass dial has well cast spandrels, those in the arch being dolphin style. There is a round signature plaque in the arch signed, ‘N. Macpherson, Edinburgh.’ The silvered chapter ring has Arabic outer numerals for the minutes and Roman numerals for the hours. It has a well matted centre with a large seconds ring below 12 o’clock and a date aperture above 6 o’clock. The eight day weight driven movement has four nicely shaped pillars. It strikes the hours on a bell mounted above the movement. It has two cast lead weights and a brass faced pendulum. Normand MacPherson was apprenticed to Andrew Dickie in Edinburgh in 1749. Normand was the son of William MacPherson who was descended from the MacPhersons of Nuid and Cluny. He was free on the 17th November 1759 and admitted as a burgess and a Guild Brother in 1763. Normand was a freeman of the Incorporation of Hammermen on 4th February 1764. His business premises were at ‘the back of the Guard’ off High Street. He was also located at the Luckenbooths in 1781 and sold his old premises in 1782. Normand died in 1783 and was succeeded by his son John MacPherson. 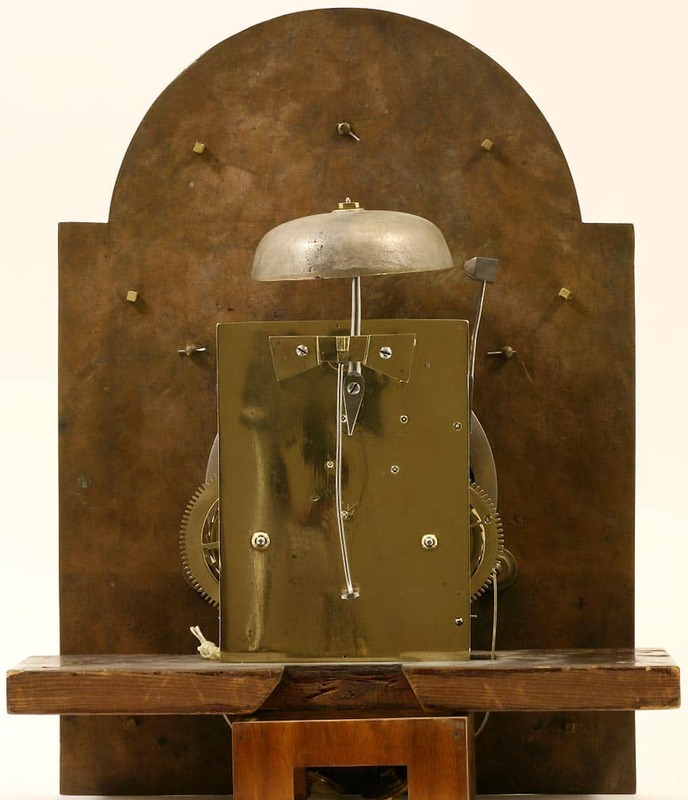 There was a longcase clock and gold cylinder watch by him in the Ilbert Collection. Further details of this intriguing maker can be found in ‘Clock and Watchmakers of Scotland’ by Donald Whyte.